I hope you have been enjoying my teaching blogs. I learned a lot by reading and applying what I read. It isn't always easy to do and it takes lots of practice, but the results are SO worth it! 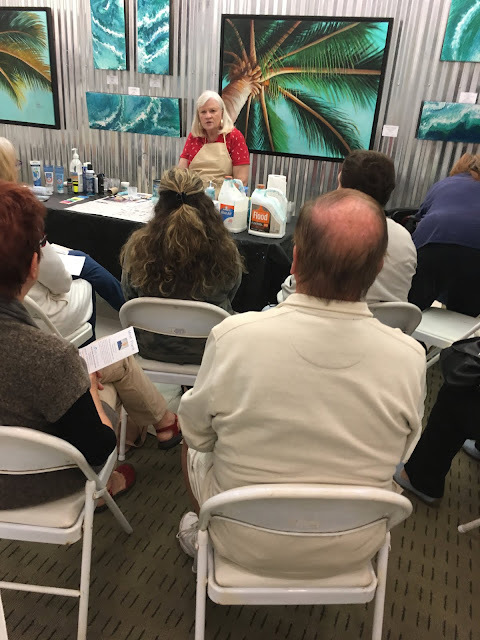 When you paint daily, you can see your artwork improve right before your eyes! An easy way to see your progress is to set a painting you did a month or even sometimes a week ago next to the one you just finished. Sometimes the difference is dramatic! And other times it is more subtle. But, trust me, there IS improvement! Yes, there will be days of frustration when you feel nothing is going right. But at those times, you can lay down your brush and take a breather. When you come back you might like it more than you thought, OR, you may see what is wrong and then proceed to fix it! But, NEVER GIVE UP! Keep painting! Right now, I am applying this advice to myself. I am working on a painting for my sister. She is seriously ill and has requested a painting. 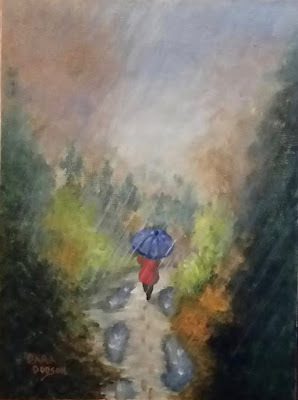 A specific painting. 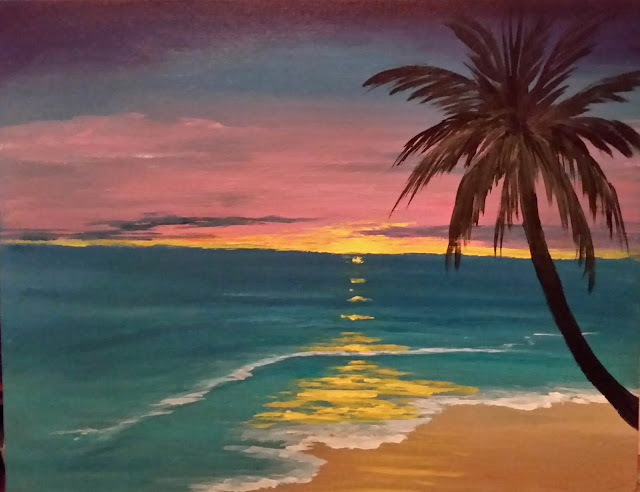 She wants an ocean sunset with, purples, PEACOCK blues, rose pinks and golds. 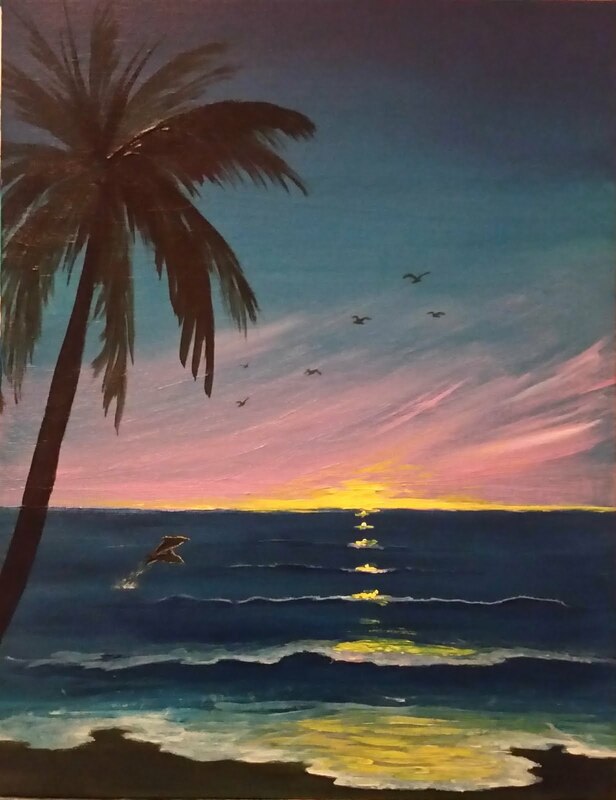 Plus she wants birds, dolphins jumping out of the water, sparkles of light on the waves and a palm tree to top it all off! That is a tall order! I am doing three. Hopefully she will like one of them. Those colors are hard to get together. The blues dull the pinks, and the purples make it dark! The peacock blue is the most important to her. That is her favorite color. I REALLY want to do this right and I am frustrated so far with my results. They are ok, but nothing like I want. So...I keep walking away and going back. Eventually I hope to be happy with one of them. I want it to be special to her. I have a couple photos below of the work in progress. They are NOT finished. I will also do a third painting so she has good choices. I need to get back to the big painting I put aside to do the seascapes for the restaurant. It has to be ready by June 5th. They moved up the entry date from July. Thankfully I had gotten an early start, but it is far from done to my satisfaction. This is the one for the Nature and Wildlife exhibit. The one that has to be very detailed. It is setting by my easel so I don't forget it. I decided that it will be a painting of the Scottish Highlands with wild Connemara horses returning to their home. I like it and hope it finishes out as I hope. Only time will tell. I have also finally managed to speak to the lady in charge of the "FEATURED ARTIST" wall at the Beaches Art Studio. I asked to be on the list of featured artists. She said it is full until September, but that I could most likely have that month. I submitted a photo and a short bio to her at her request. Since I mentioned a biography. I have a photo below of an outline I got off another website for a bio. 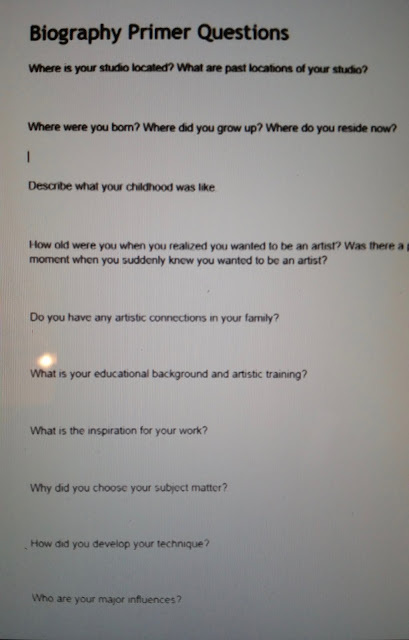 It asks questions that help you decide what to write about yourself. If you answer them all the bio will be long. But not all answers are necessary. It's just a guideline. Sorry, I digress. 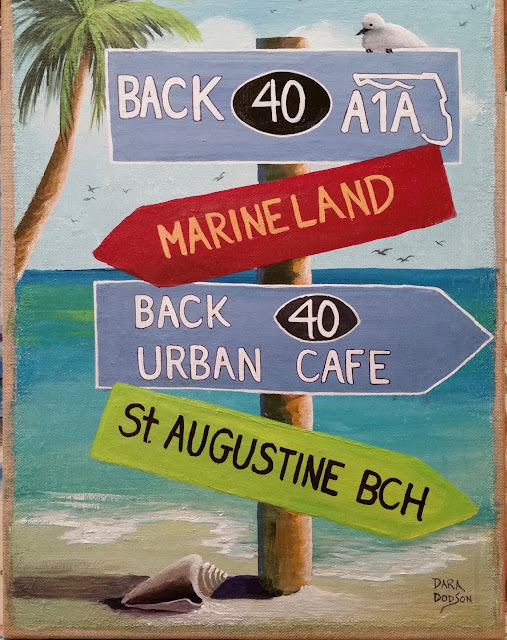 I did a painting as a "housewarming" gift to the owners of the BACK 40 A1A for asking me to hang my art there. I think I mentioned that I ended up placing 15 paintings total there. It opened this past Wednesday, March 15th. My husband and I were invited to a "soft" opening on Monday the 13th. A test run for all the new equipment, etc. The new tea machine wouldn't work right. So we drank sodas! But while there, I came up with a cute idea for their gift and went home and painted it right away while it was fresh on my mind. It was another of the "stacked directional signs" like I painted earlier, but this one had the names of both of their restaurants on it, plus a couple other locations. I had a beach setting with a nice shell on the beach and a seagull roosting on top of the sign. Really cute! THEY LOVED IT! It pays to thank your sponsors! The photo is below, so Enjoy and Thanks for looking! These locations are all real and are in the correct direction from the Back 40 A1A location making it more fun! These next paintings are the ones I am working on for my sister. This is the first choice. It is not finished. The birds and dolphins have not been added yet nor the finishing details. Again, these are not finished yet, but you can get an idea of what the painting will look like. I haven't started the third choice yet, but I think I will make the sky and water lighter in it.